I've spent a bunch of my free time lately playing with a program called Hero-O-Matic, one of several programs available on the net for creating images of superheroes and and adventurers. The reason that I was looking for a hero generating program was to illustrate a story that has been kicking around in my head for a couple of years, the story of a mystery woman, a female adventurer who has inhabited the various worlds of pulp and comic book fiction over the last century. Initially, I knew her only as The Mystery Woman, but somewhere along the line she acquired a comic book nom de guerre—Bette Noir—and then a sidekick and eventual partner known as Bella Donna. The two of them together, I eventually called "Beauty and the Beast". Bette starts her career as a pulp hero, like The Shadow or Doc Savage. Slowly, she evolves through Green Hornet and Blue Beetle costumed adventurer stage to a full blown Batman-like comic book hero. Her Chauffeur, Giordano is replaced by a teenage sidekick, the lovely Bella Donna. 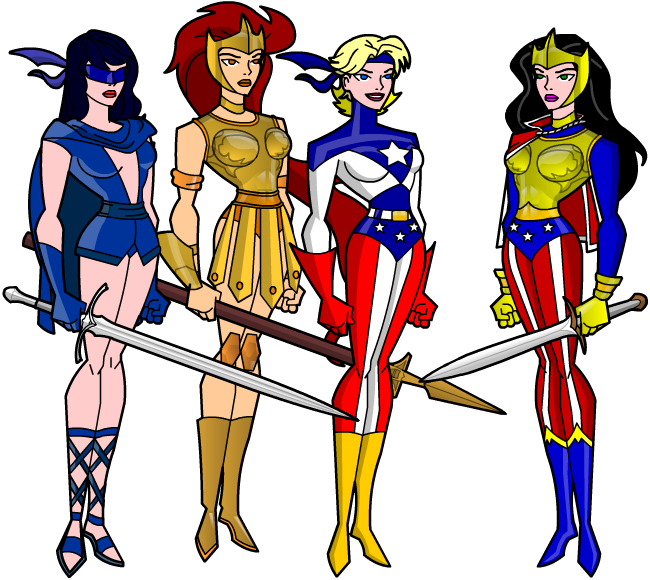 Like Robin, there are several Belladonnas over the years, one or two of whom take on the persona of "Deadly Nightshade". Their tale is told in a separate web page, which I initially illustrated with another superhero generator—Heromachine. When I stumbled upon Hero-o'Matic, and its successor, Fábrica de Heróis, I decided to add a little variety to Bette's page, generating a cover for a "Johnny DC"-style version of the "Beauty and the Beast" comic. 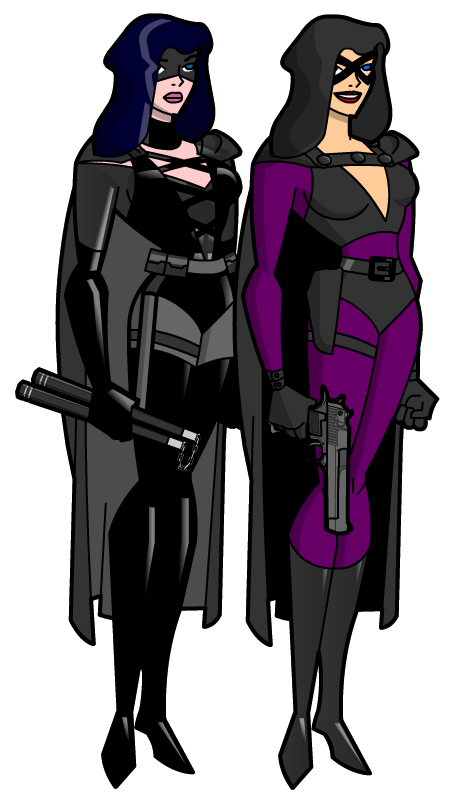 The images of Bette (in black and gray with a blue hood) and Bella (in purple and gray), to the right came were generated for that cover. For Bette's career to parallel the history of comic books, she needed to join a couple of teams and interact with other men and women of mystery. 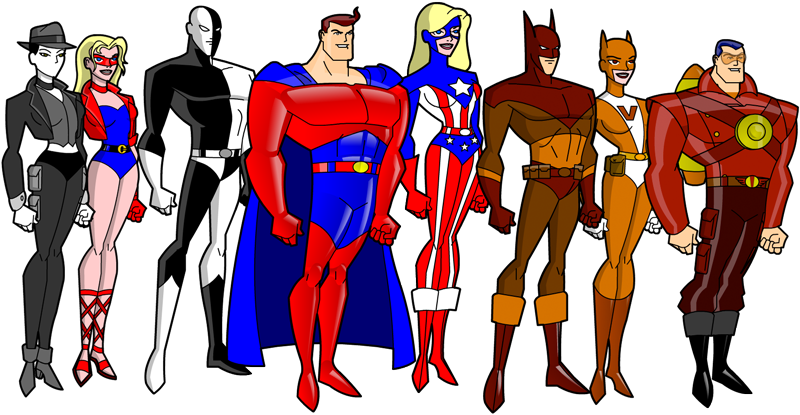 To that end, I recruited a number of other characters I had made up over the years, either purely for my own amusement of for a couple of superhero role playing games I ran. Heromachine and Hero-o-Matic were so much fun, that I've created images of many of them. Here are several. 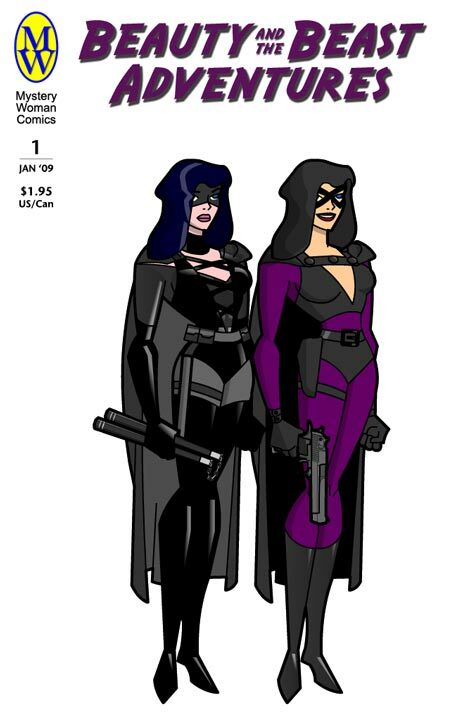 On the left are Masquerade, Mistress of Disguise and her sidekick Domino, a pair created specifically to be teammates of Bette's in "The Good Girls" in the 1940s, and "The Bad Girls" in the 1980s. Masquerade borrows from the hat wearing adventuresses Miss Masque and Lady Luck of the 1940s, Steve Ditko's faceless heroes Mr. A and the Question from the 1960s (who also inspired Rorschach of The Watchmen), and disguise artists of all eras. Originally, I envisioned her dressed in red, like the public domain Miss Masque, but sadly, Alex Ross revitalized Miss Masque and to keep her distinct from Bill Black's version of her, renamed her Masquerade. Domino seemed an obvious name for Masquerade's young sidekick. To their right is one of the first comic book characters I ever made up, Twilight, who was inspired in small part by Dr. Midnight and an early 1960's fanzine character, The Eclipse. Twilight's power is that he can emit either light or darkness, and of course, see in that dark. Every comic book world needs a Superman/Captain Marvel analog. Just as Astro City has The Samaritan, my comic book universe has Paragon, the Man of the Future. Likewise, every universe must have at least one red, white and blue super-patriot, à la Captain American, Uncle Sam, The Shield or Fighting American. In fact, there are so many of them that it's hard to think if a name that hasn't been taken. I can therefore, hopefully, be forgiven for naming my Old Glory-clad heroine, Young Glory. Beside her stand The Fox and Vixen, a pair of non-super crime fighters of the Batman and Robin, Catman and Kitten variety. A distant relative of mine was a hero to the local West Virginia rebels during the Civil War, and in his memory, the Fox is sometimes known as "The Blue Fox". I've presented them here, though, in their more natural color coordinated version. Filling out the picture is Ace Eldridge, of the Rocket Patrol, a Rocketman-, Commando Cody-, Rocketeer-like character, that "just growed" as I was playing with Hero-o-Matic. The quartet to the right was made up about 25 years back for a Superworld role playing game I ran. To the right, we have Columbia, the Spirit of America, facing the three sisters she empowered: Justice, Victory and Liberty. At times, the first and last have been known as Miss Justice and Lady Liberty. The girls are the three daughters of a general who was the last male in a long line of soldiers dating back to the founding of the nation. The girls would have followed their father's example at the outbreak of WWII, but women were not permitted to serve in the military. And so Columbia granted them iconic powers and identities.